Advantages: Better light reflection and dispersion of colors than any other Ideal Cut Diamond, premium over diamonds of the same/similar appearance due to the Hearts & Arrows pattern. 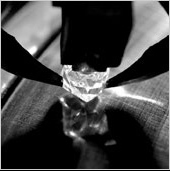 diamond for it can only occur when each of the diamond’s facets align exactly. 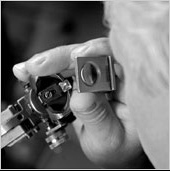 When viewed through our scope, you to see the symmetrical alignment of the 68 facets by showing 8 distinctive arrows when the diamond is viewed from the topside. When viewed from the bottom side, the scope allows you to see the same optical symmetry by showing 8 distinctive hearts. When combined, the symmetry of this diamond makes for an ideal cut never seen before. The ldeal² Diamond is cut to the most exacting standards which have been established to be ideal in terms of proportion, polish and symmetry. 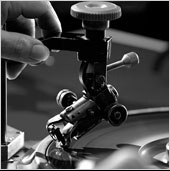 Diamond cut refers to the angles and proportions of a diamond. A diamond crafted to use these angles correctly will internally reflect light from one mirror-like facet to another and disperse and reflect it through the top of the stone. The diamond cut, how well it has been polished and the proportions and symmetry, are of the singularly most important factors in determining the life, brilliance and dispersion of a diamond.